Google Tag Manager should be relatively easy to implement. Just paste the container snippet to the <head> of the page and you’re good to go! However, at some point you’ll want to configure the dataLayer structure, too (read more about dataLayer here). There are two ways to do it: the right way and the wrong way. In this article, we’ll see what happens if you do it the wrong way, how to identify the issue, and how to fix it. 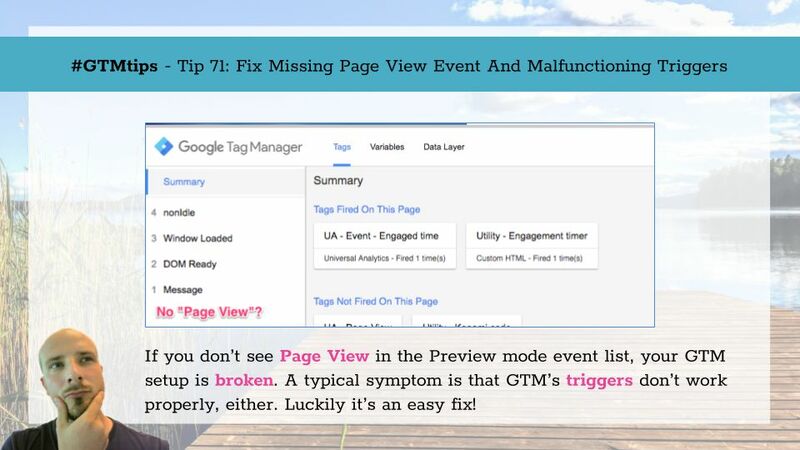 Tip 71: Page View event missing, and GTM’s triggers don’t work? Page View - This is the event pushed into dataLayer in Google Tag Manager’s container snippet (event name is gtm.js). DOM Ready - This is the event pushed into dataLayer once the page HTML has been rendered by the browser (event name is gtm.dom). Window Loaded - This is the event pushed into dataLayer once the page and all linked resources have completed load, execution, and render (event name is gtm.load). You should always see (2) and (3) - there’s very little you can do to mess these up. But it’s possible you won’t see the Page View event. If you don’t it means you’ve messed up the dataLayer implementation. See the problem? By using the syntax var dataLayer = ..., you are resetting the dataLayer variable to a new Array, thus overwriting anything that was in it before (such as Google Tag Manager’s own listener). Since you overwrite dataLayer, it no longer works properly with GTM, and a typical symptom is that GTM’s triggers don’t work anymore, either. So if you have a Click / All Elements trigger on the site and nothing is pushed to dataLayer when you click around, chances are you’ve overwritten GTM’s dataLayer with your reinitialization. How to fix it? Simple. Always check for the existence of dataLayer before adding items to it, and always add items to dataLayer only with the push() command. This is a popular topic on this blog and many others simply because it’s so easy to screw it up. It doesn’t help that somewhere in GTM’s documentation there are still instructions to use the declarative method for setting up dataLayer. 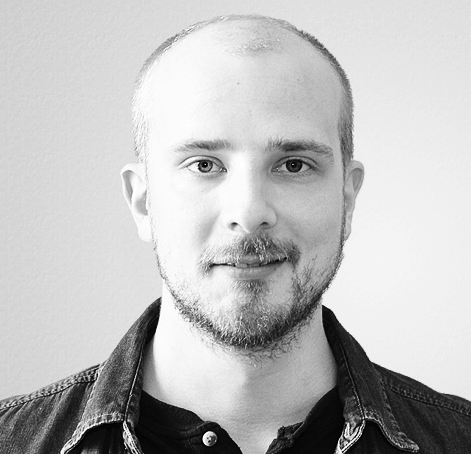 Any other typical Google Tag Manager mistakes you can think of, which have been around for a long time, and probably will surface for a long time to come?